Traditionally, cooking en papillote means using parchment paper. Not the kind you write on, so don’t go looking for it at your office supply or card store. It’s baking/cooking paper that is treated with a bit of nonstick magic and it has countless uses in the kitchen. Sure I use it to line cake pans and cookie sheets and wrap things like sandwiches, but in a pinch I also use it like a funnel for dry ingredients or a nonstick surface to roll out doughs. It’s pretty freaking versatile. I prefer the precut sheets that King Arthur Flour sells and I find that the 100 count really is a Best Buy. The $19.95 that I just spent to restock my supply will get me a year, maybe a year and a half, or parchment perfection. Yet, as much as I am a fan of cooking parchment, when a recipe calls for something to be cooked en papillote I reach for something else. Aluminum foil. Yes, my carbon footprint is probably ginormous from the amount of foil that I use but I’d rather throw away a grody, sticky, greasy sheet of foil than scrub a charred sheet pan. Since The Mistah is usually on clean up duty, I think he prefers it too. The reason I like it for cooking en papillote is that unlike parchment, foil gives you a good seal on your packet. So all your moist goodness doesn’t go running out of the packet and onto your pan or tray or oven bottom. I dislike cleaning up spills in my oven even more than scrubbing grody sheet pans. So for me, the aluminum foil is a win-win. My carbon footprint and I have made peace with it. I found myself reaching for the foil when I pulled yet another old Cooking Light recipe out of the folder. According to my online search to find out when the recipe was published, this has been waiting patiently to come out of the folder for almost five years. 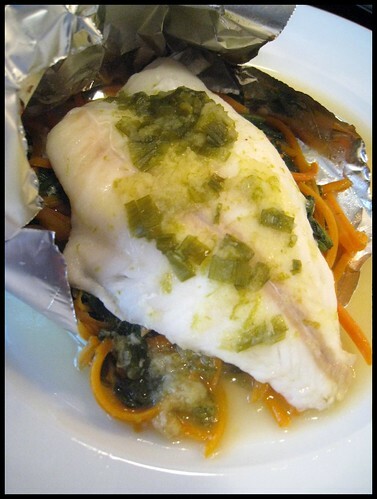 For five years I’ve missed out on Lime Scented Orange Roughy and Spinach’s easy goodness. I am ashamed of myself. Once you try it, I think you’ll see why. BAH Note: Instead of slicing carrots, I used prepackaged shredded carrots. By the time they came out of the oven they were very soft. Next time I may wilt the spinach and then add the carrot to the pan so that they retain a bit of firmness. I also added the spinach and garlic at the same time to ensure that the garlic would not turn bitter or burn. Be sure to zest your limes before you juice them. Trying to run a microplane grater over a juiced lime is not fun, quick, or easy. My fillets were small and thin so I cooked them for 15 minutes, turned the oven off, and let them stay in the oven for another five minutes to avoid overcooking the fish. If you want a bit of heat, add your favorite hot pepper to the mirin, lime, ginger sauce. Combine 1/4 teaspoon salt, green onions, mirin, lime zest, lime juice, and ginger in a small bowl and set aside. Heat oil in a large nonstick skillet over medium-high heat. Add carrot and saute 2 minutes or until tender. Add garlic and saute for 15 seconds. Add spinach and remaining 1/4 teaspoon salt and cook until spinach wilts. Fold 4 (16 x 12 inch) sheets of heavy duty foil in half lengthwise. Open foil and place about 1/2 cup of the spinach mixture in the center of each sheet. Top each with 1 fillet. Drizzle mirin mixture evenly over fillets and season with pepper. Fold foil over fillets and tightly seal edges. Place packets in single layer on a sheet pan and bake for 20 minutes or until the fish flakes easily when tested with a fork. I’m going to have to try those precut parchment sheets! I love the KAF catalogue! I use those parchment sheets all the time. They used to ship them in a large cardboard tube but my most recent order did not come packaged like that. Good thing I hadn’t gotten rid of the tube. It’s a bit tricky to roll the lot of them up and get them in the tube but it can be done. For real, there’s a leg lamp in Canton? I was just over that side of town on Saturday but didn’t go through the square. Damn, I’ll have to get back there. Maybe tomorrow night for the contest. I love cooking fish this way! And I, too, usually use foil…guilty! Jessica, the solution is easy…break out the foil and get cooking. The prep for this recipe is the hardest part. Once those packets are in the oven, pour yourself a drink because your work is done. YES!!! This is how I make fish in the winter with the aluminum foil and it is fabulous. Thanks for sharing on here! I love adding different types of vegetables, spices, and zests under and over the fish and making it an entirely different meal every time! This really is a super easy way to cook fish. Best of all, the house doesn’t smell fishy when you’re done. I may try this one on my mom. She is a fish afficionado ( even though she can’t cook it worth a darn. example steakfish fried every Friday per Catholic regimen. and done to a dry, wallpapery consistency) I recall her saying she liked orange roughy I will pick a day and go up and surprise her with dinner. Emily, that sounds like the fish that we used to have to eat as kids – dry and boring. Hope your mom likes this alternate approach.